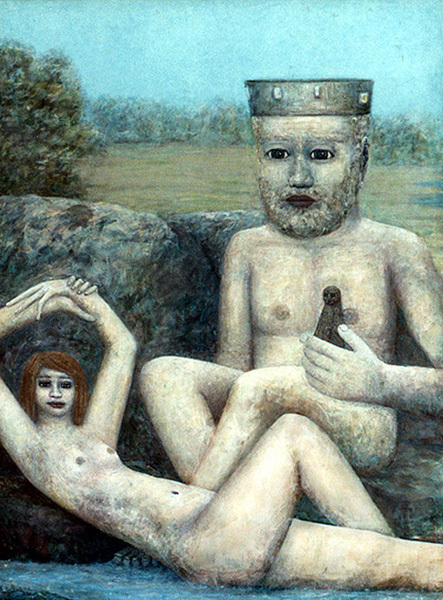 Patrick Maisano, ''King and Muse,'' mixed media. The term “fractured fairytales” takes on a new, gloomier shade than the old Rocky & Bulllwinkle cartoon series in Patrick Maisano and Shannon Richardson’s joint painting venture, “Fairy Tales & Monsters,” a decidedly contemporary take on all things flighty and frightful. One thing that makes this “monster show” unlike many others is that neither artist strays toward the grotesque, a popular avenue of shock that has been stripped of the ability to do so. The work here instead remains rooted in the subtly of terror beneath the surface that always expresses a more ferocious and disturbing quality. The softly painted shades of pastel spring are delicately darkened throughout the exhibition, and the situations of the storybook characters are fraught with indecision and alarm. In Maisano’s "Red Riding Hood" both the Wolf and Red seem engrossed in an odd staring contest in the forest, each one waiting for the other’s next move. That next move might look something like Maisano’s "Goldilocks," in which the towheaded tween makes a mad dash for the stairs, one paw swipe ahead of a three-headed bear. Richardson’s work is a continuation of these traditional fantasies, taking them beyond fabled texts and into nuanced nightmares that seem pleasant upon first glance, until we note that the maidens have ominous ghouls shadowing them who reach out for strangle-hold hugs or appear as disembodied heads swooping in slowly for a screech, as in "Directions from the Wind." It’s a perfect combination of works from two ethereal-minded artists whose senses of humor are firmly intact and fully transfigured into gorgeously grim tales.